In A Corpse in the Koryo, James Church introduced readers to one of the most unique detectives to appear in print in years—the elusive Inspector O. The stunning mystery was named one of the best mystery/thrillers of 2006 by the Chicago Tribune for its beautifully spare prose and layered descriptions of a terrain Church knows by heart. And now the inspector is back. In Hidden Moon, Inspector O returns from a mission abroad to find his new police commander waiting at his office door. There has been a bank robbery—the first ever in Pyongyang—and the commander demands action, and quickly. But is this urgency for real? Somewhere, someone in the North Korean leadership doesn’t want Inspector O to complete his investigation. And why not? What if the robbery leads to the highest levels of the regime? What if power, not a need for cash, is the real reason behind the heist at the Gold Star Bank? Given a choice, this isn’t a trail a detective in the Pyongyang police would want to follow all the way to the end, even a trail marked with monogrammed silk stockings. “I’m not sure I know where the bank is,” is O’s laconic observation as the warning bells go off in his head. A Scottish policeman sent to provide security for a visiting British official, a sultry Kazakh bank manager, and a mournful fellow detective all combine to put O in the middle of a spider web of conspiracies that becomes more tangled—and dangerous—the more he pulls on the threads. Once again, as he did in A Corpse in the Koryo, James Church opens a window into a society where nothing is quite as it seems. The story serves as the listener’s flashlight, illuminating a place that outsiders imagine is always dark and too far away to know. Church’s descriptions of the country and its people are spare and starkly beautiful; the dialogue is lean, every thought weighed and measured before it is spoken. Not a word is wasted because in this place no one can afford to be misunderstood. 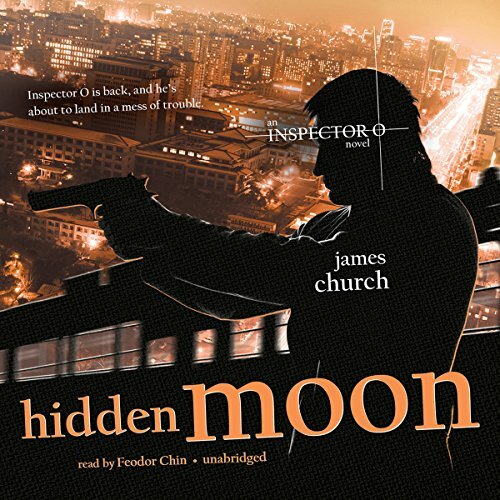 ©2007 James Church (P)2011 Blackstone Audio, Inc.
Church's second Inspector O novel struck gold with its dialogue and textured setting, was hit-and-miss with its characters, and was only so-so in developing its plot (sorta felt phoned-in on a spotty line). For me, the novel was a bookshelf whose corners just didn't quite square. You can tell the Church cared about the project, but the pieces just didn't all fit in the end. If you could sum up Hidden Moon in three words, what would they be? The first book had a wonderful level of depth, that was missing in this installment of the series. What aspect of Feodor Chin’s performance would you have changed? More range and energy,, he seemed to be a bit flat with playing females, or coming off flirty , etc. What did you love best about Hidden Moon? What about Feodor Chin’s performance did you like?